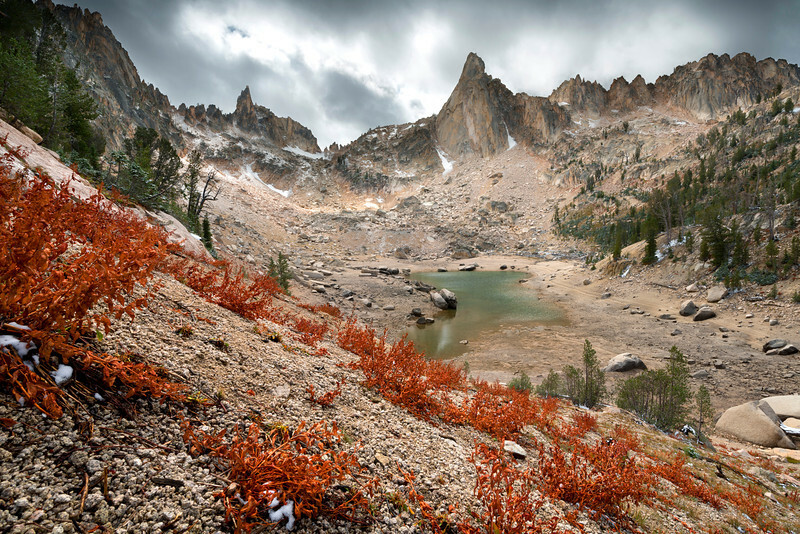 Not far from Redfish Lodge, in the Sawtooth Wilderness Area, is a small cove of lakes - walled in by massive flanks of granite. Only a tiny slot near a cascade gives access to this area - where crossing beaver swamps, climbing over hundreds of downed trees, scrambling through a twisting labyrinth of loose stones and gravel, all lead to this image point. Here, in the early fall, the ground cover has turned crimson and the snow falls lightly throughout the day. The Rotten Monolith is seldom climbed from this side, and the first ascensionists actually reported placing pitons right into the rock by hand - without a crack!